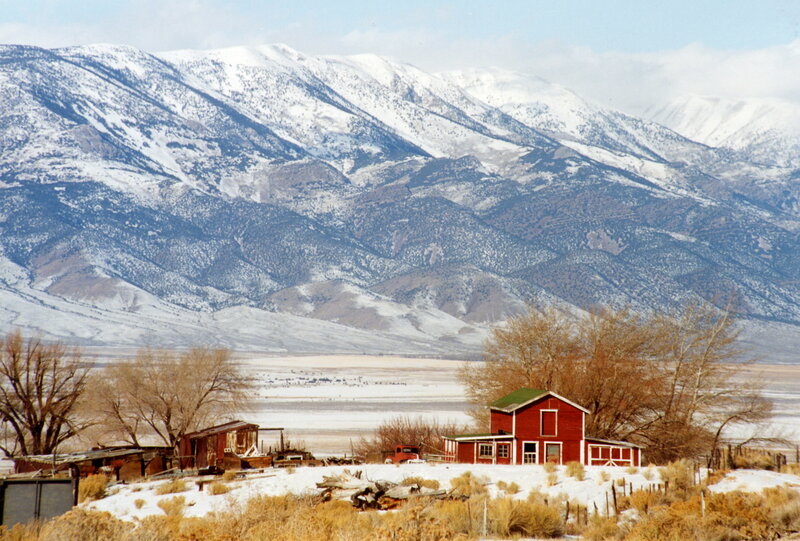 There is nothing quite like the American West and one can never have enough of it. 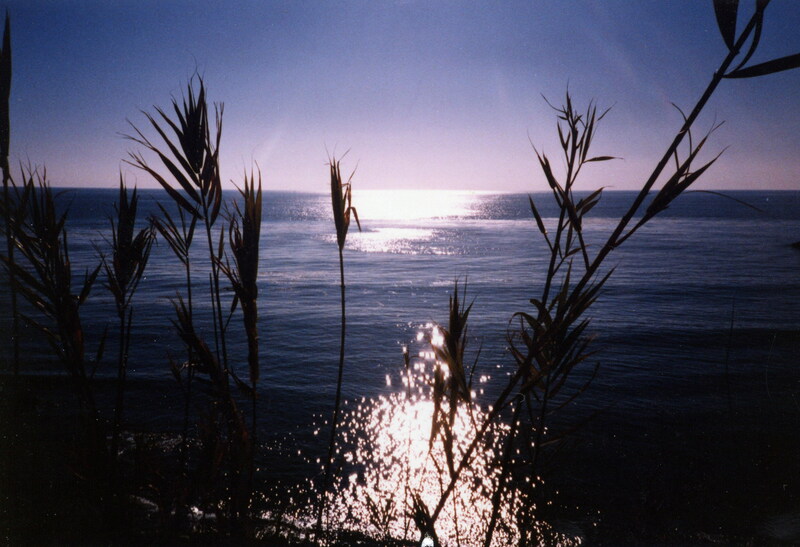 These are just a few scanned pictures I took from my very old Pentax KX100. 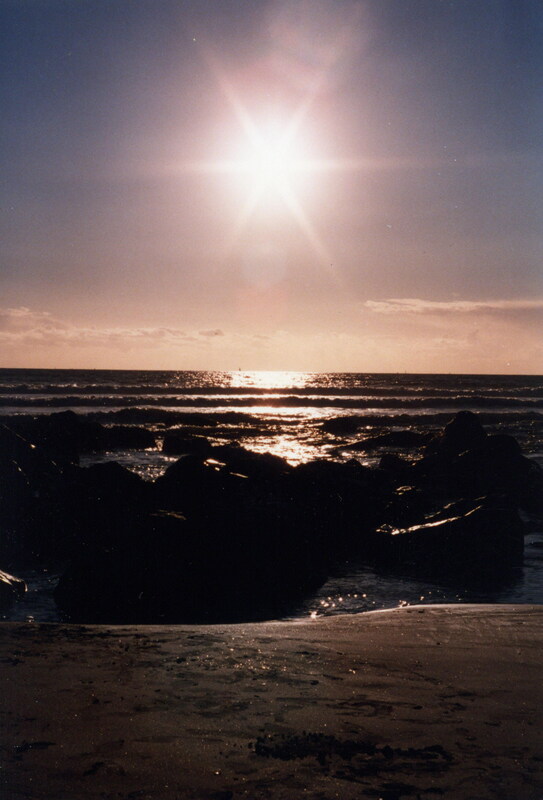 Most were taken during the 1990s and are a rather mixed lot taken from frequent family trips (mainly inspired by my English grandfather). Some of the best shots were taken with ASA 25 speed film and a tripod. Not far from Alliance, Nebraska is this strange out-of-the-way place called Carhenge. I just had to take a look. I wasn’t disappointed. 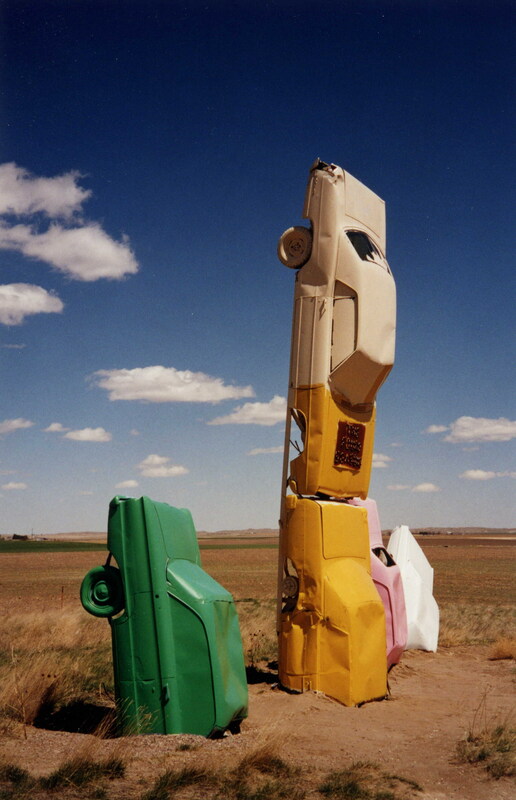 There was no one about and you found yourself in a field full of old cars in strange positions. In the light spring breeze, all you could you hear was the gentle creaking of the metal of the cars swaying. 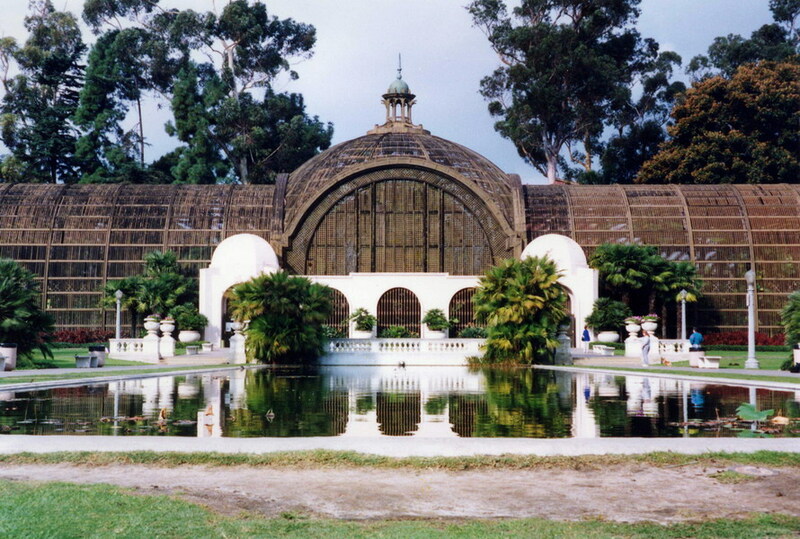 Balboa Park contains a great science museum and is next to the world-famous San Diego Zoo. 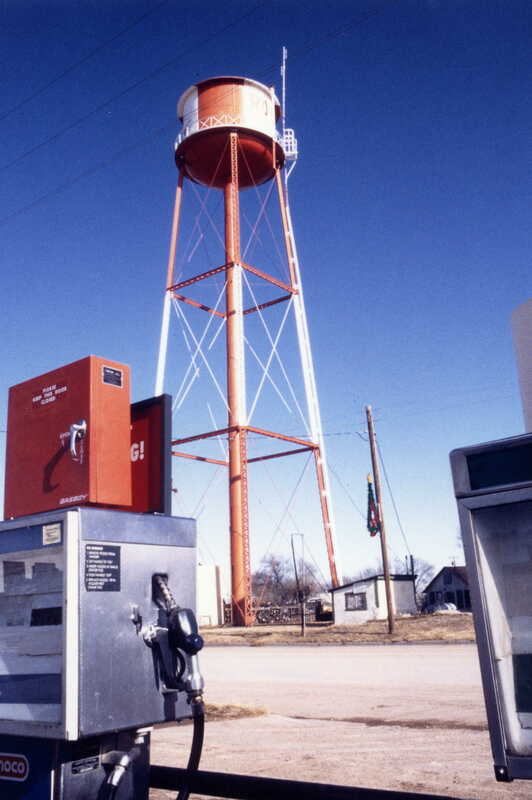 A very typically American Midwest scene. Yellowstone National Park in Wyoming is located in my favourite place on the Planet including the Grand Tetons and Jackson Hole. 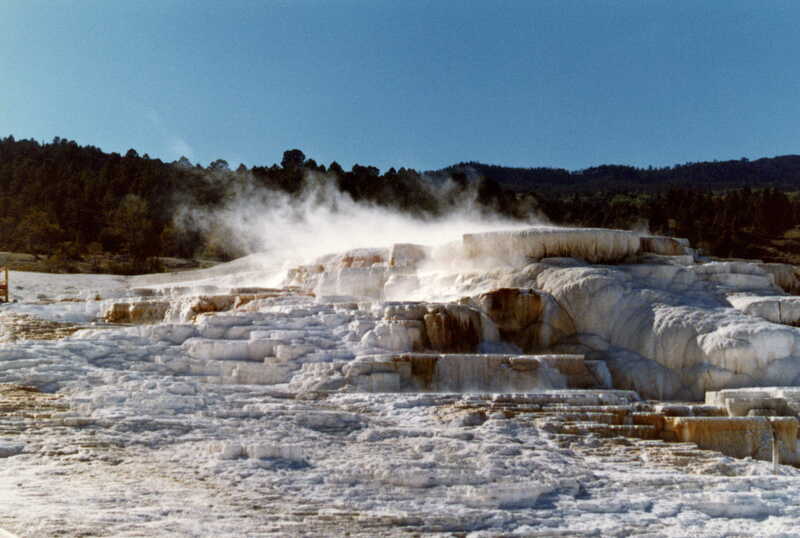 It has thermal basins with beautiful hot springs, wild rivers and waterfalls, high mountains (nearby Grand Tetons National Park), abundance of wildlife and fantastic hiking trails. 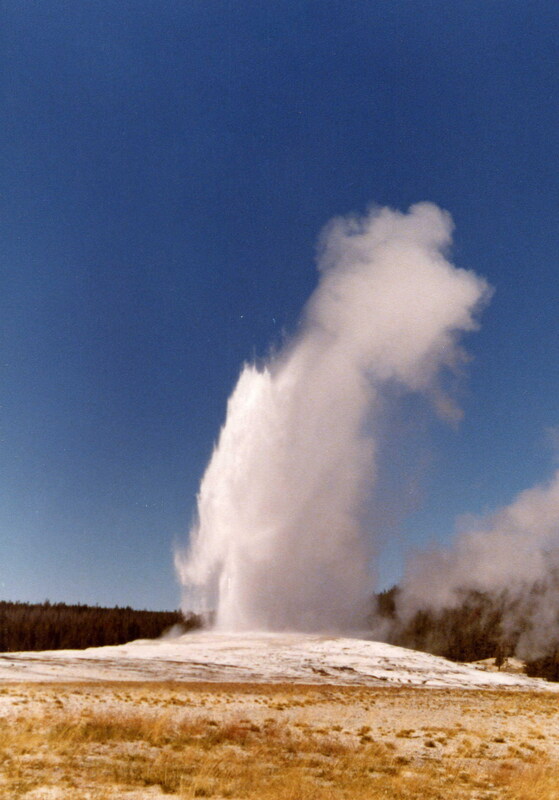 The most famous but not most powerful geyser in Yellowstone. It’s famous as you can be guaranteed a good show every 60 minutes. 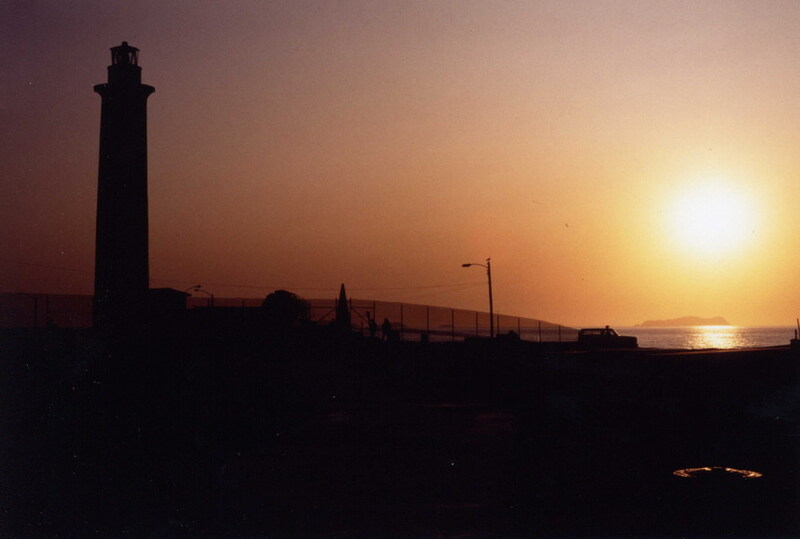 California is famous for its Pacific sunsets. Must be seen to be believed. 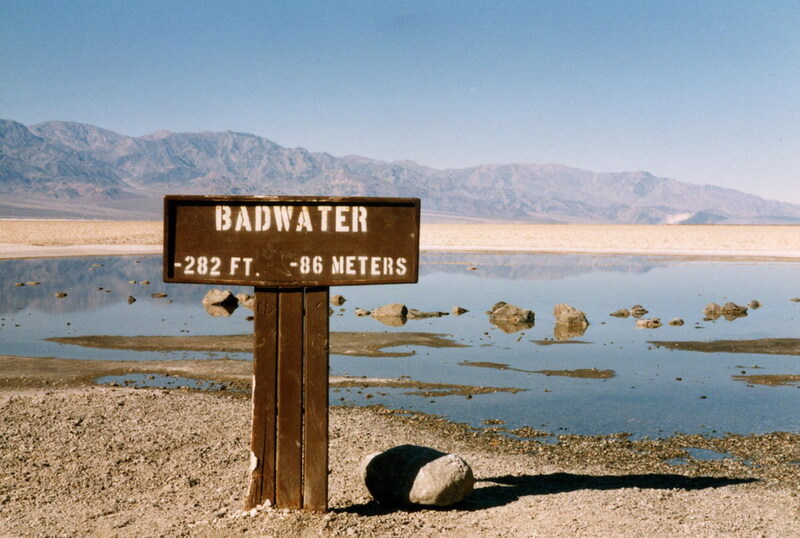 This shot has been used in so many movies. 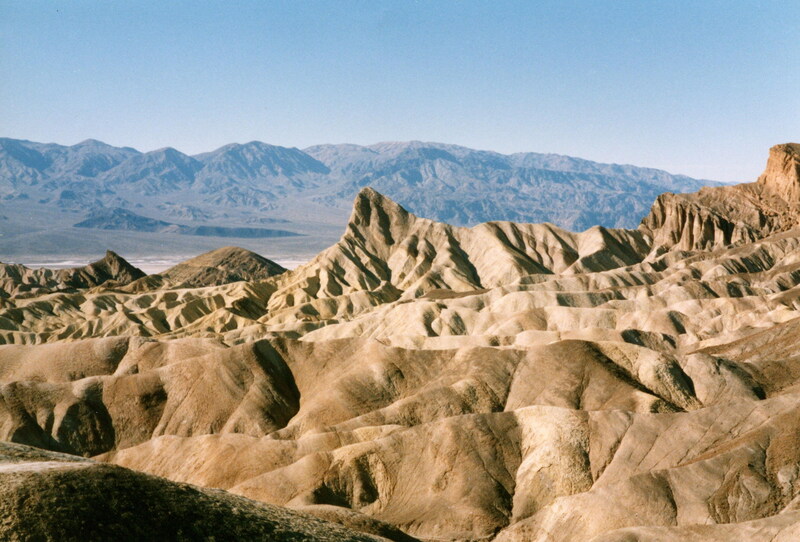 Death Valley is an alien landscape where the lowest point is below sea level and the surrounding mountains are over 14,000 ft high. In summer, temperatures are astonishingly uncomfortable! 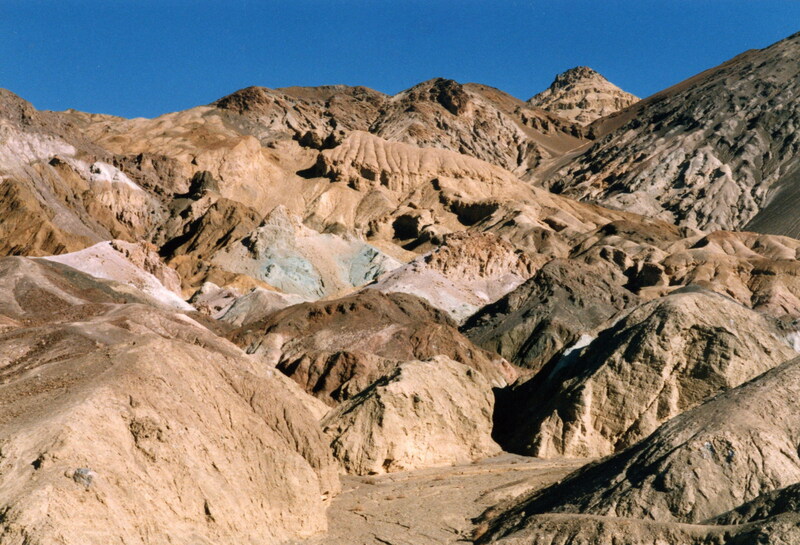 The minerals in the soil have created a multi-coloured landscape at the Artist’s Palette. 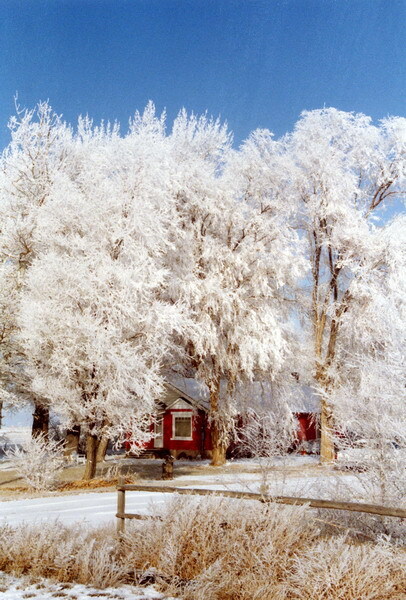 Severely cold morning near Delta, Utah. 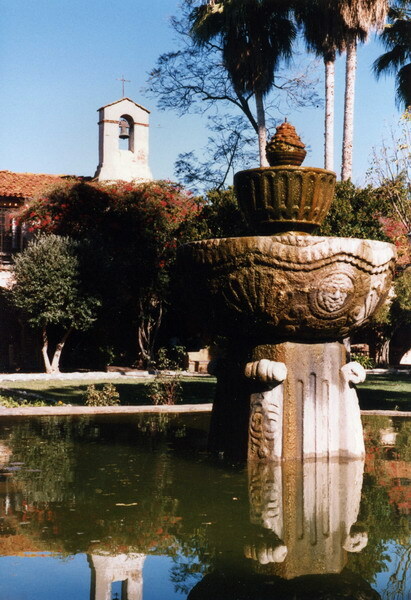 Halfway between San Diego and Los Angeles, not far from Laguna Beach lies San Juan Capistrano. 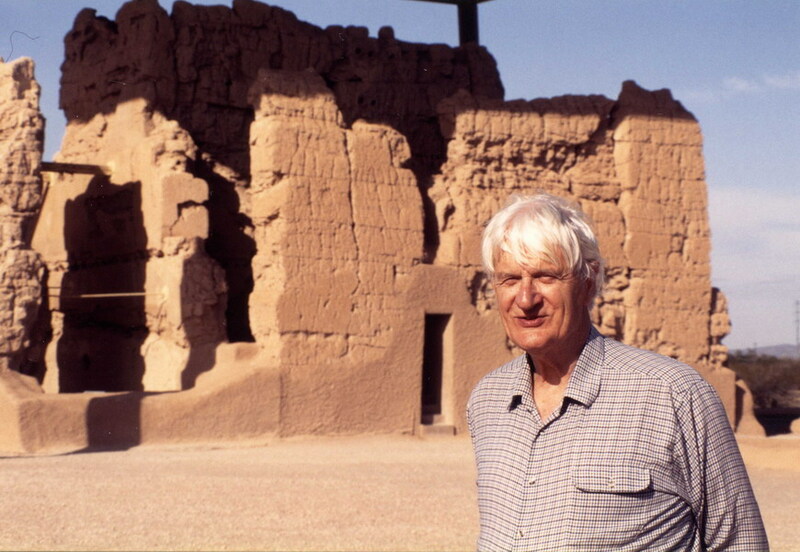 A preserved missionary. The people you see in the photograph are standing over 6,000 ft above sea level. 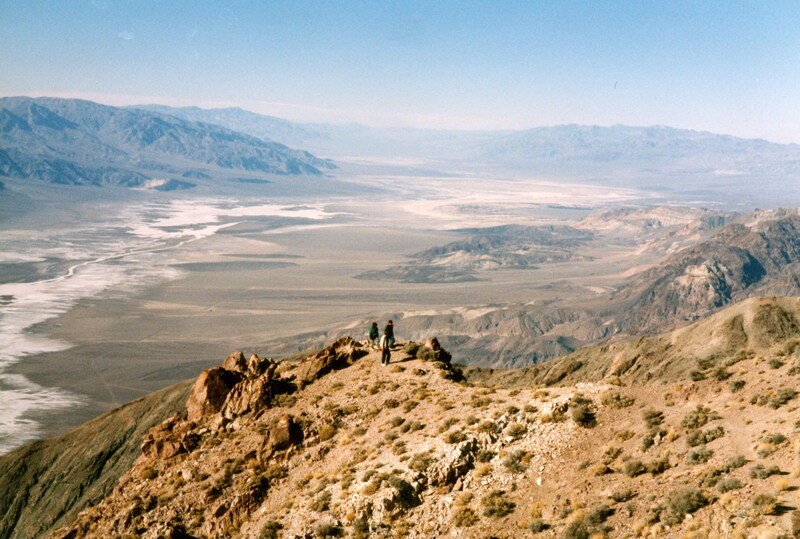 The valley floor is 200 ft below sea level. You do the math! Well here it is, the 3rd lowest point in the world (excluding the Hollick-Kenyon Plateau in Antarctica which is under 14,000 ft of ice). The lowest point is the Dead Sea in Israel at -1,312ft and the second lowest is Lake Assal in Djibouti at -512 ft. 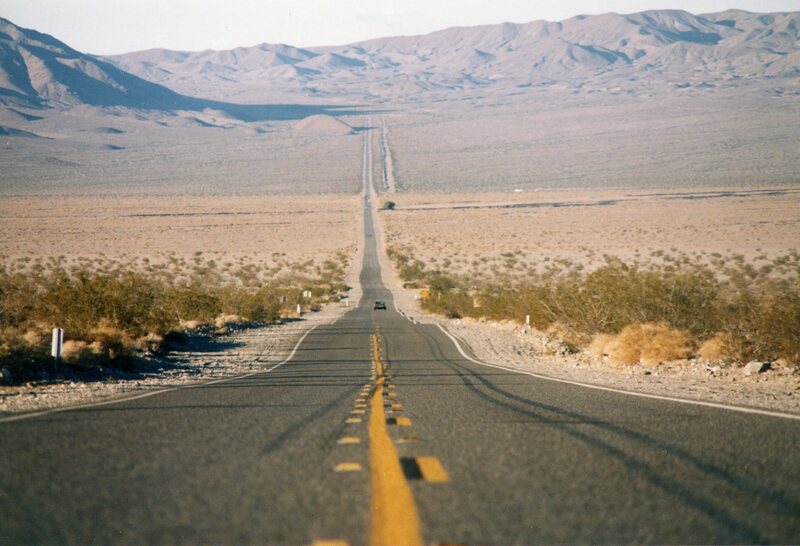 The classic road of the American West. I was, indeed, lying on my stomach whilst taking this shot. I did, of course, have someone have a good watchout for any errant vehicles coming my way! I really took time to set up this shot so I’m quite proud of this one. 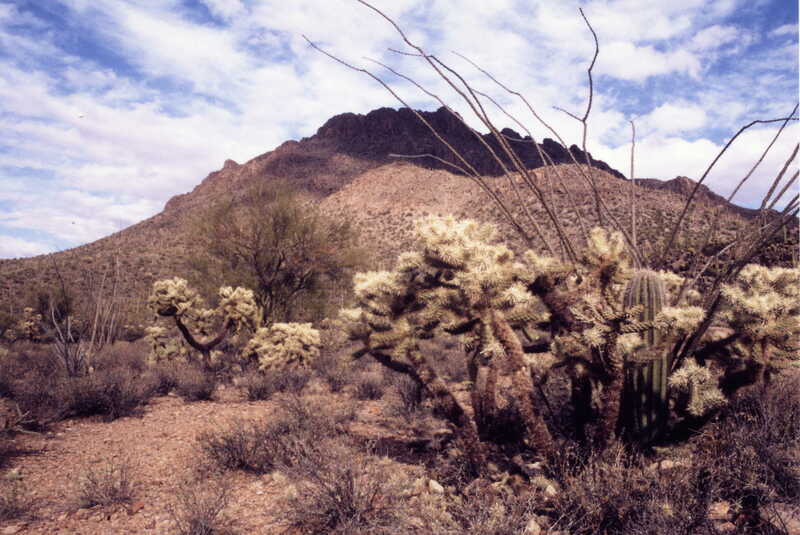 It is along Route 50 and really shows the variation between low and high points across the route. 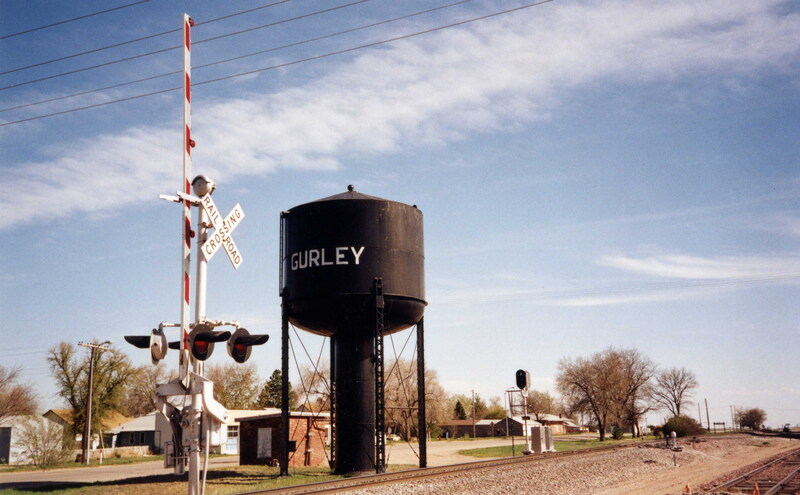 Located near Guadaloupe National Park, this is a town of nearly 12 people! There was one diner and next to it was an assortment of vicious looking cactus. In the background lies the corner of Guadaloupe National Park. I always wander how such a place survives. Set aside by President Benjamin Harrison in 1892, Casa Grande (Big House) is the first cultural and prehistoric site to be protected by the US Government. 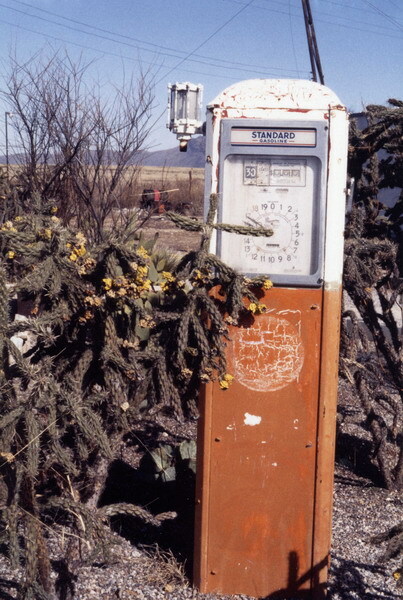 This is near the town of Coolidge, Arizona. 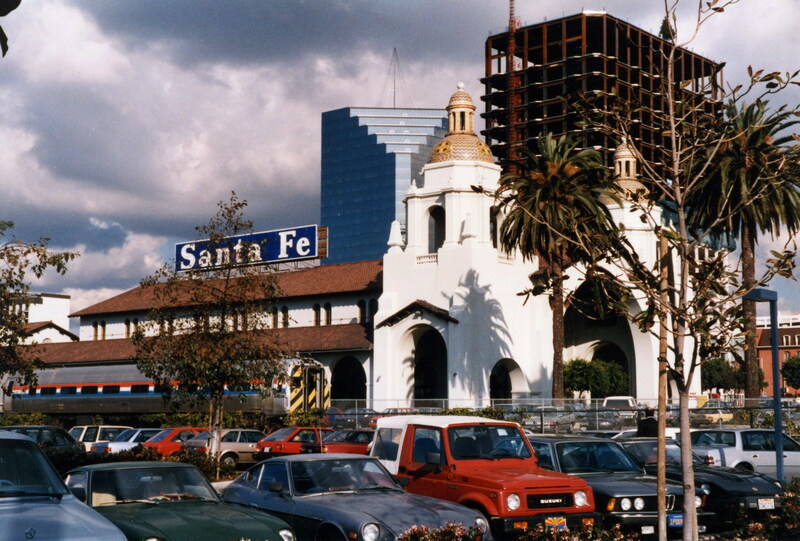 Classic Spanish style architecture at San Diego’s main railroad station. 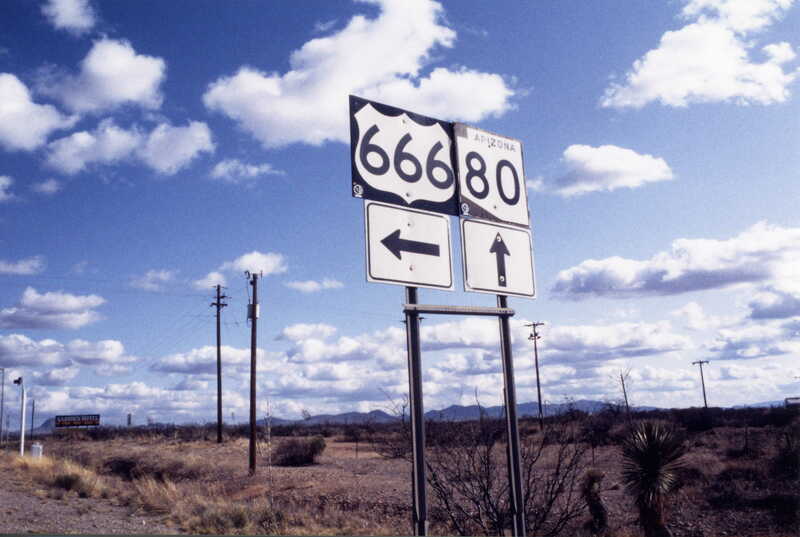 Considering America’s religious fervour, I was quite surprised to find there was a Route 666! 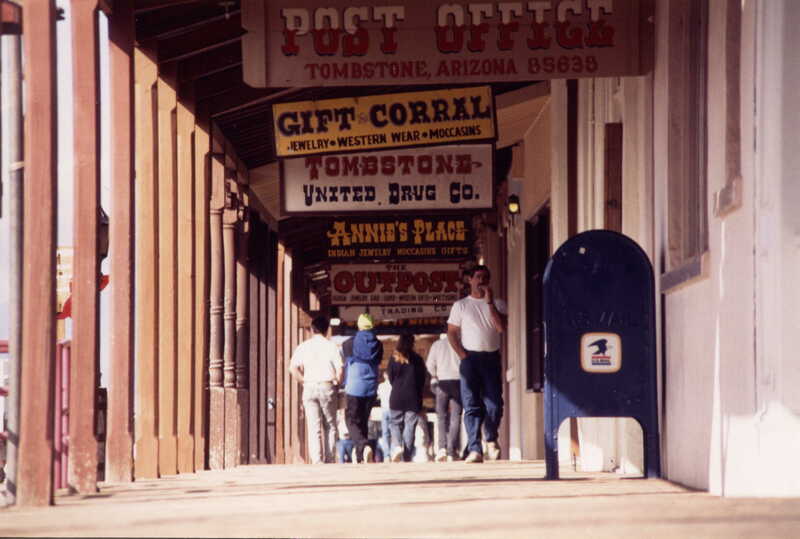 Just south of Tombstone and at the very southern edge of Arizona is the copper mining town of Bisbee. 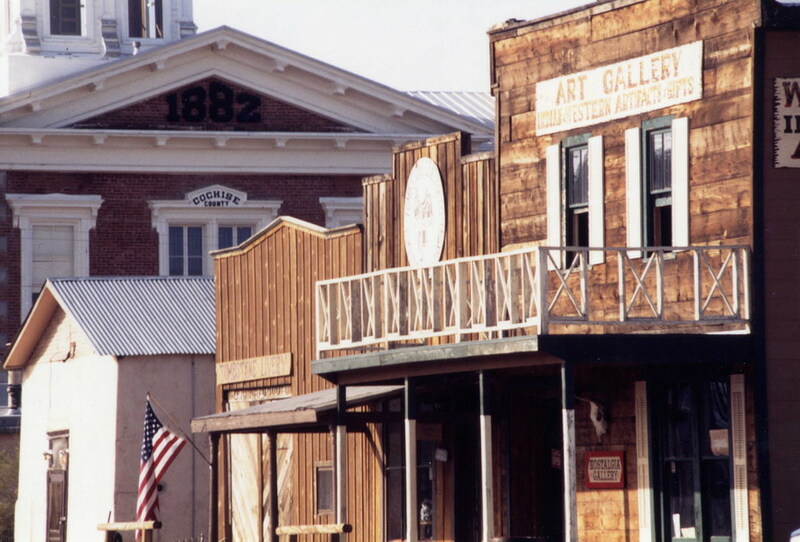 This is an amazingly well-preserved mining town with very few tourists. They usually go to Tombstone instead! Although it is quite a tourist attraction, it has not been spoiled by the legalization of gambling. 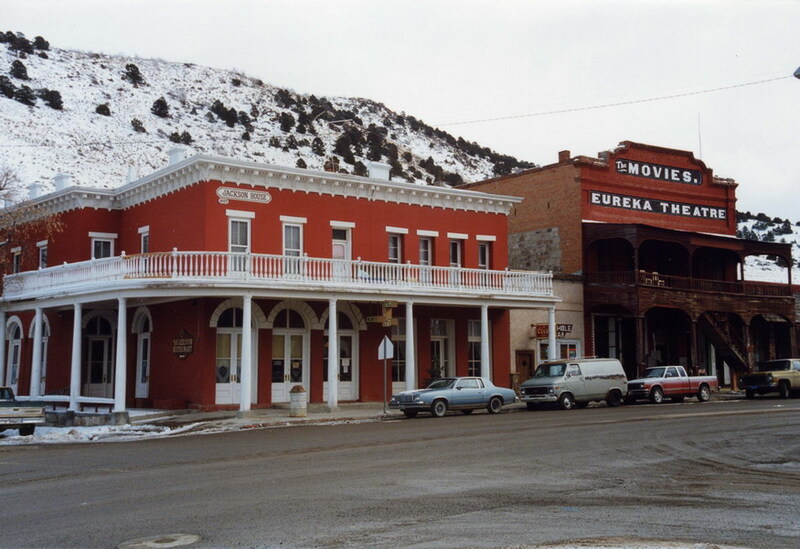 Two of my favourite towns in Colorado, Central City and Cripple Creek, have been destroyed (in my opinion) by allowing casinos to be built. There are some remarkably well-preserved saloon bars here in Tombstone and even an opera house. 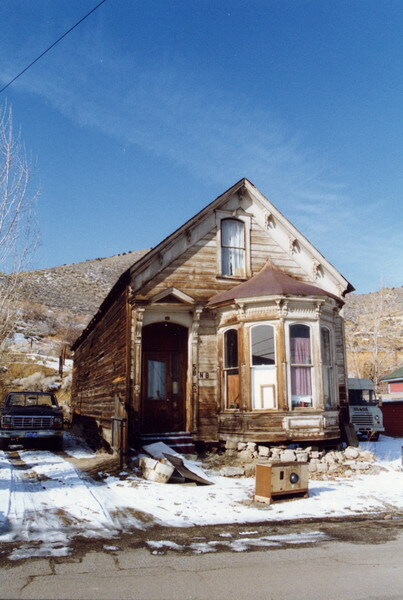 It is similar, in many traits, to the town of Virginia City in Nevada. 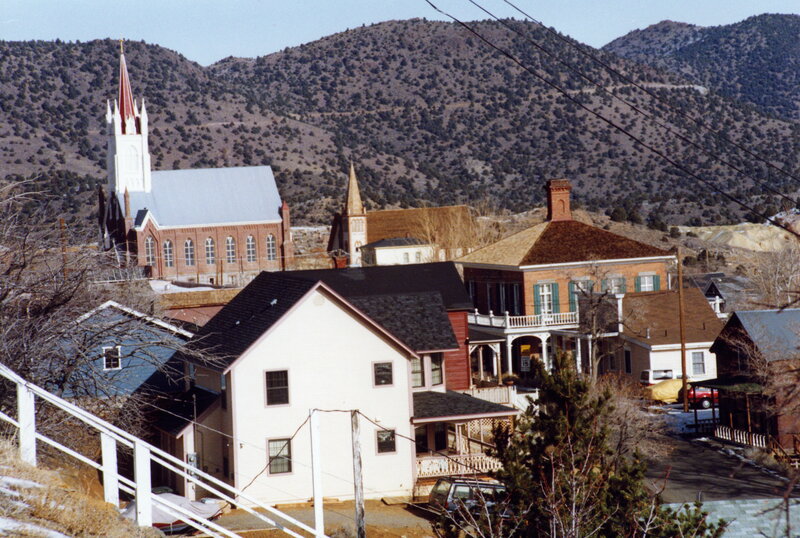 High up in the Western Plateau lies the preserved silver mining town of Virginia City. 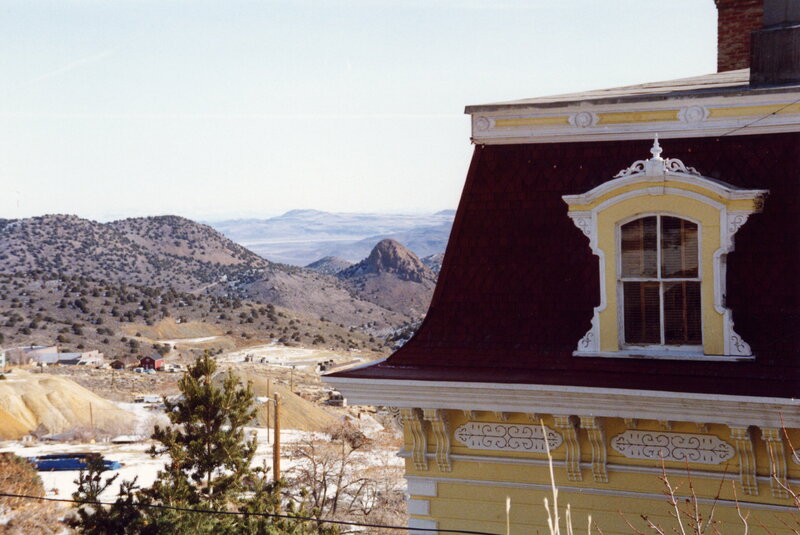 Gambling is allowed here but it has not spoilt the town like Cripple Creek, Colorado. 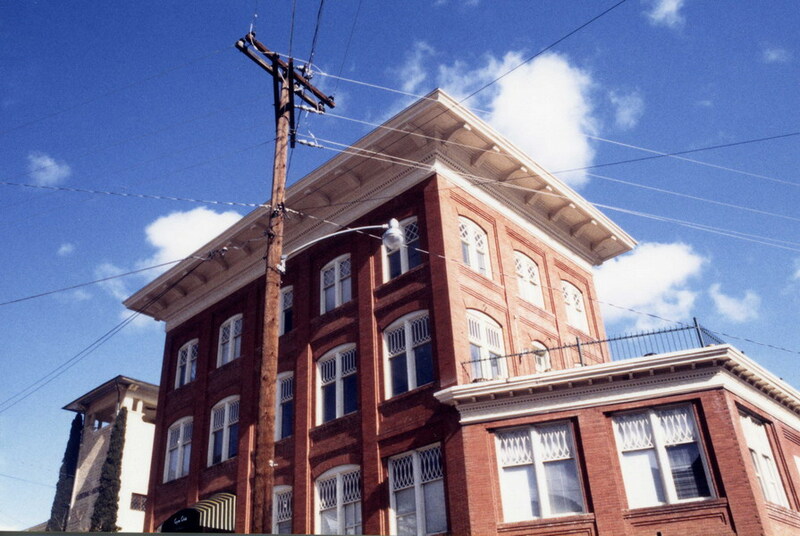 I really enjoyed this place and loved exploring the streets and photographing the old buildings. Just south of Monterey is the iconic town of Carmel where even the roads have to be built around the trees by order of the local law. 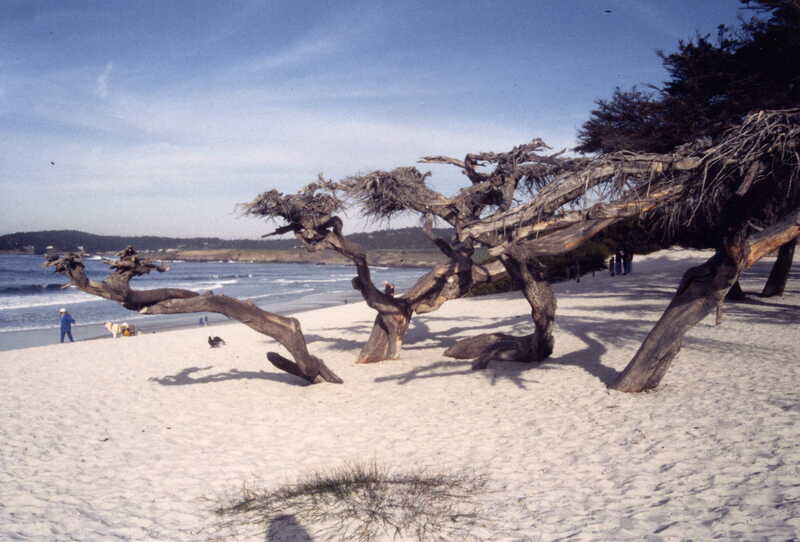 Carmel is an exclusive place famous for its odd-looking cypress trees and pure white beaches as you can see in this photograph. Clint Eastwood was mayor here. It’s odd to find this ornate Eastern European-style architecture in the middle of Nevada. I guess they’re in need of a TV replacement! Traditional boardwalks where women were not allowed to walk on the sunny side. 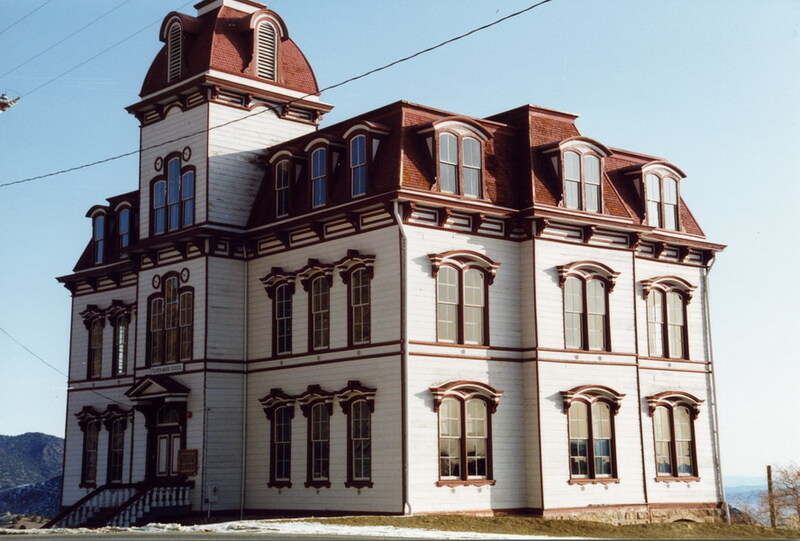 Here’s a picture of the old schoolhouse. 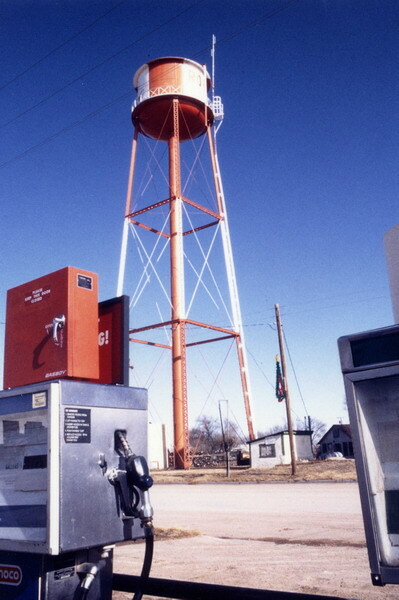 In fact, I think it may still be in use. Despite what the photographs may suggest, you have NO idea how cold it was that day! Would be a great photograph if it wasn’t for the street signs. 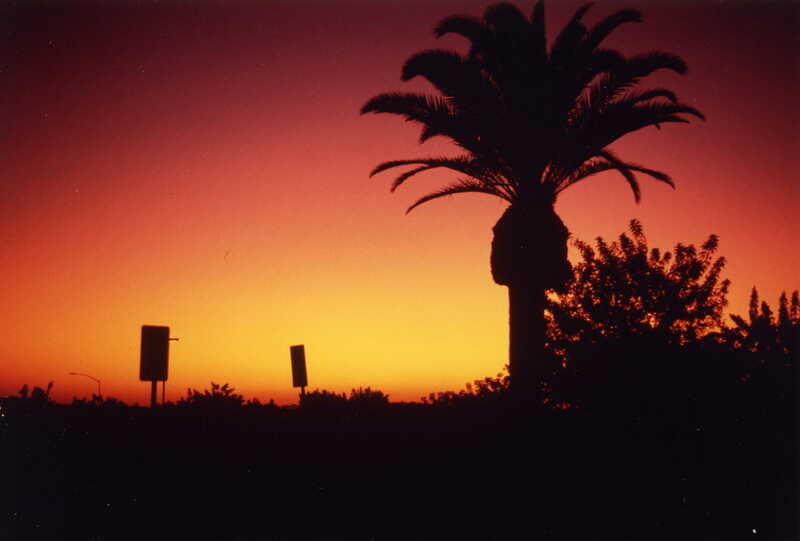 This was taken outside the office my mother was working at in San Diego. 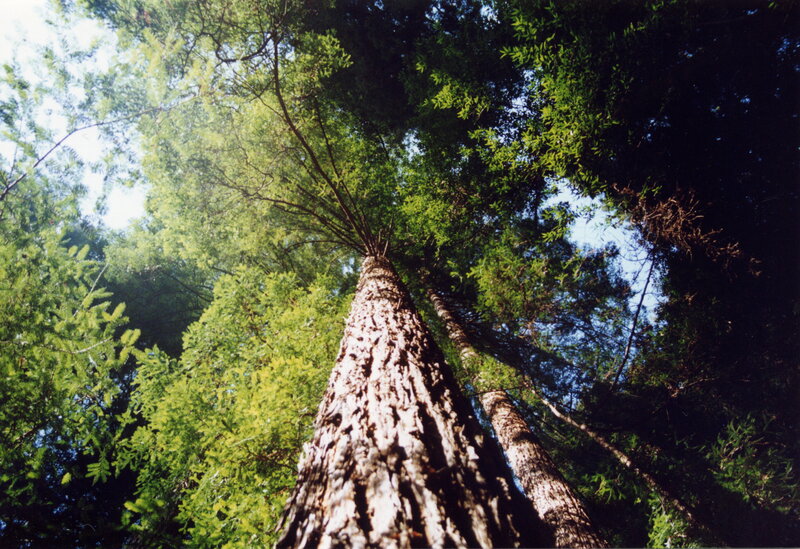 Just north of the Golden Gate Bridge in San Francisco lies the amazing Muir Woods with the world’s tallest trees. 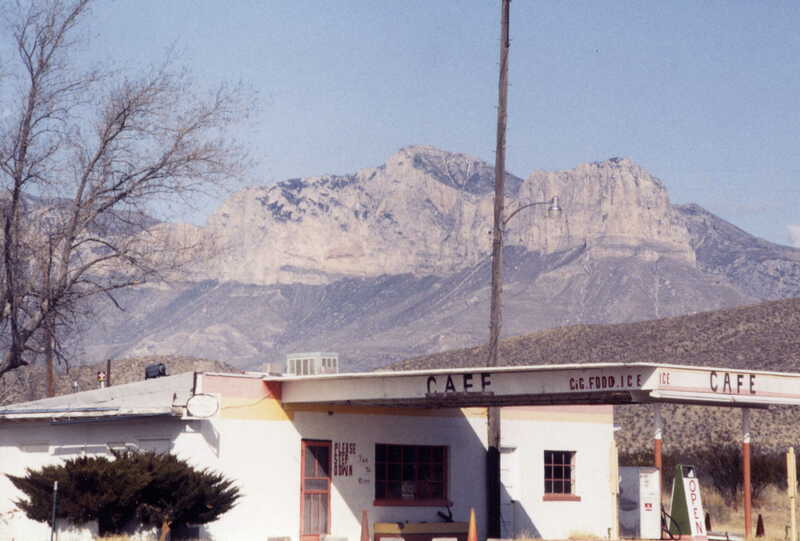 This is the southwestern corner of the United States (excluding Hawaii). You can see Mexico on the other side of the heavily-patrolled fence. Tuscon is world-famous for its lightning storms and its western movie filmsets. 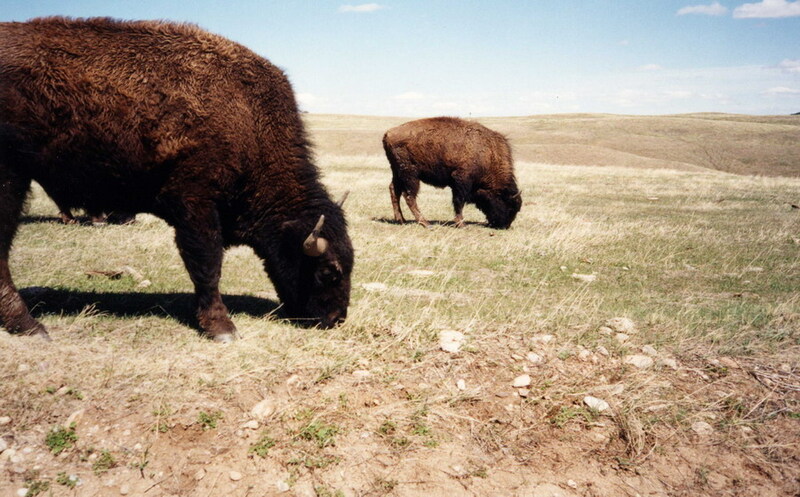 As docile as they may seem; best to stay in the car! 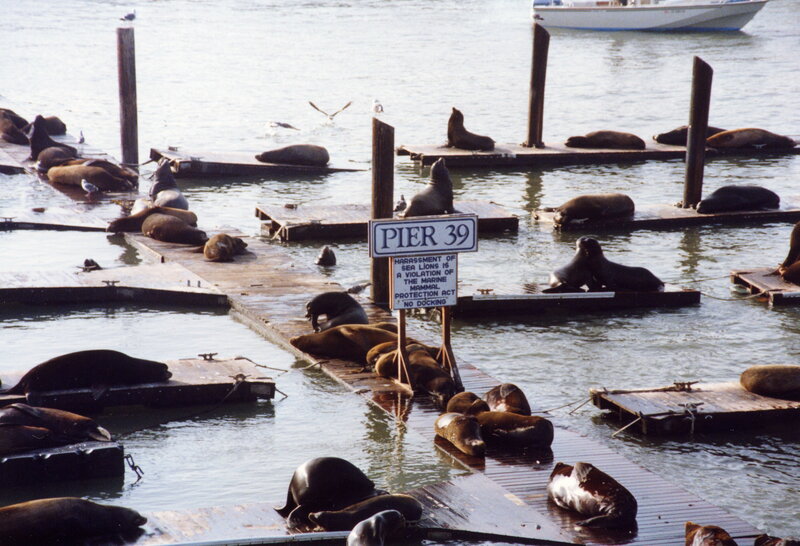 A pier completely dedicated to sea lions! 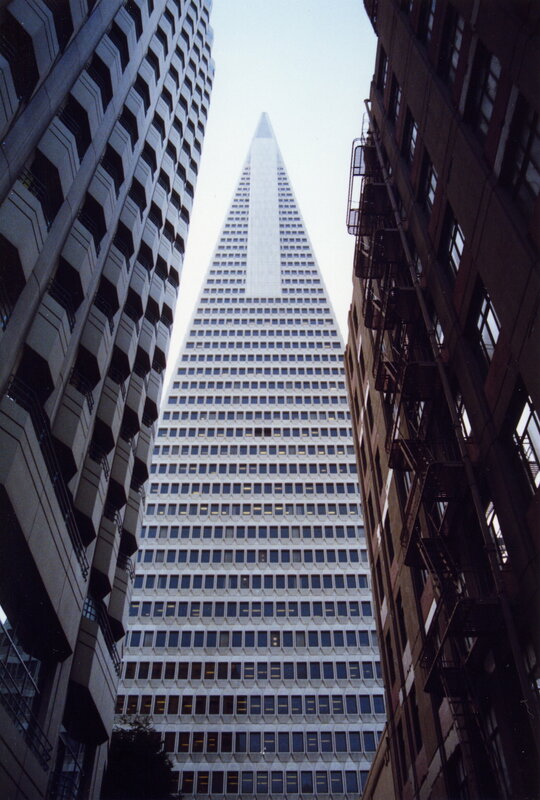 This is the famous earthquake-proof building shaped as a pyramid. It is San Francisco’s iconic building. This beautiful hotel is the place to stay in San Diego (if you can afford it). 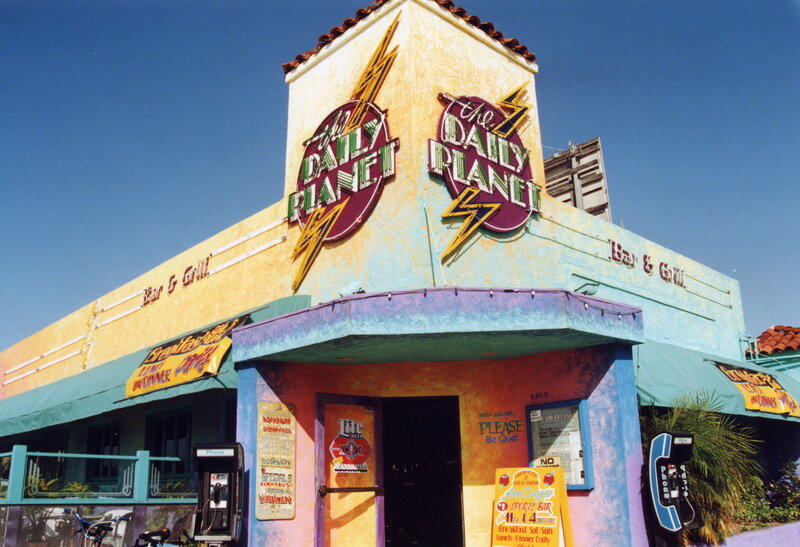 Marilyn Monroe made this place famous in the movie, Some Like It Hot. 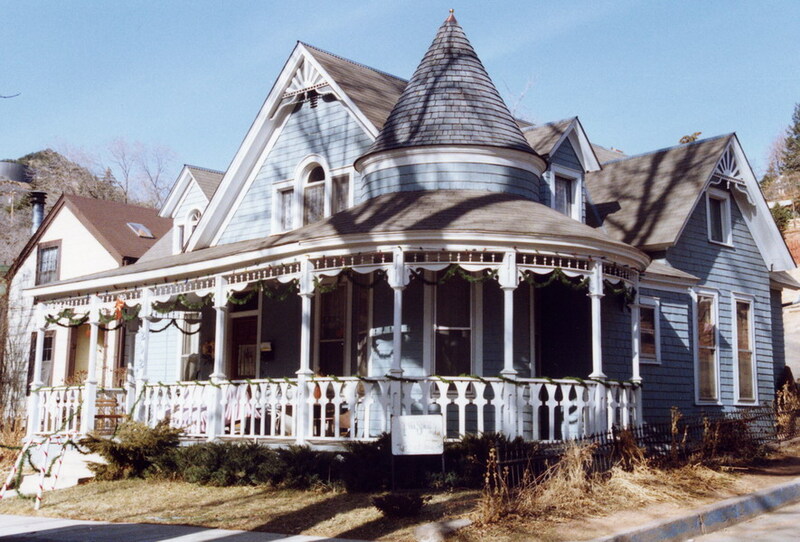 It is delightfully Victorian inside where you can enjoy High Tea and have the most magnificent Sunday Brunch you’ve ever had. 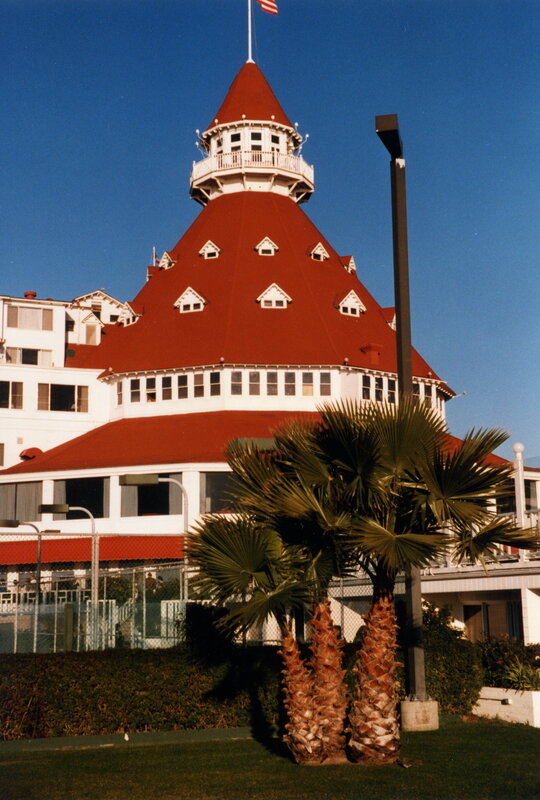 This was taken from the white sands of the famous beach of the Coronado Hotel in San Diego. 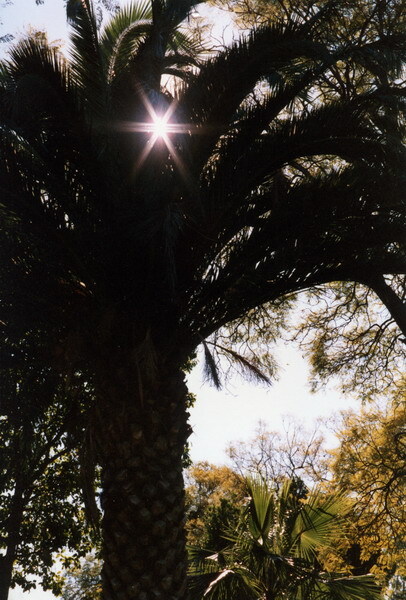 Good ‘ole Phoenix Canariensis, the trusty Canaries Palm. This was taken outside the Coronado Hotel in San Diego. Manitou is also the beginning of the Great Barr Trail which has the highest gain in elevation of any trail in the US. It goes from 6,000 ft to 14,010 ft (top of Pikes Peak). I’ve done this a few times! Boulder is a wonderfully cosmopolitan town in the foothills of the Rocky Mountains on the Front Range. 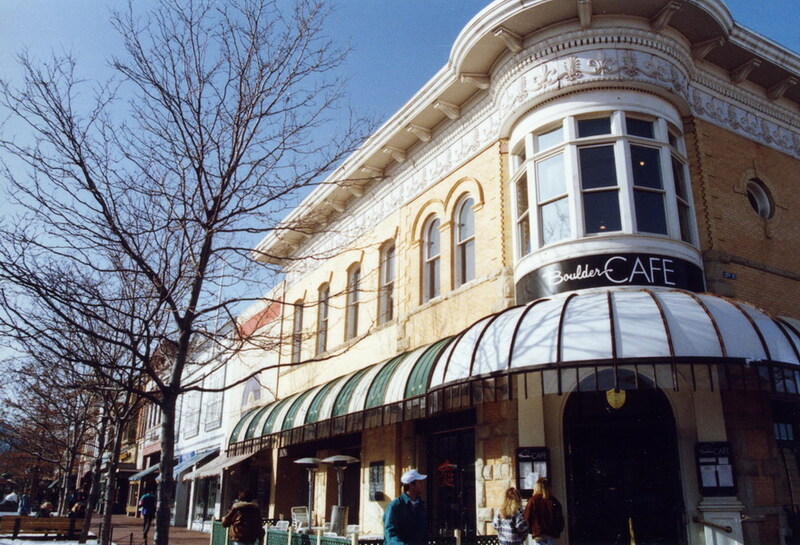 It is home to the famous flatiron rocks and home to the University of Colorado. Typical wacky beachy surfy architecture in Pacific Beach. This is the sort of area where it’s compulsory to like surfing and rollerblading. 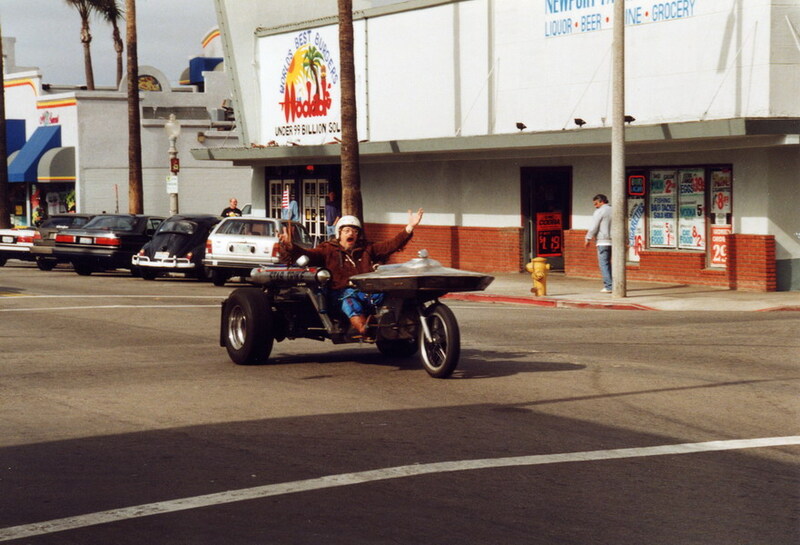 This is the nutty but great world of Ocean Beach, San Diego where all the eccentrics hang out. 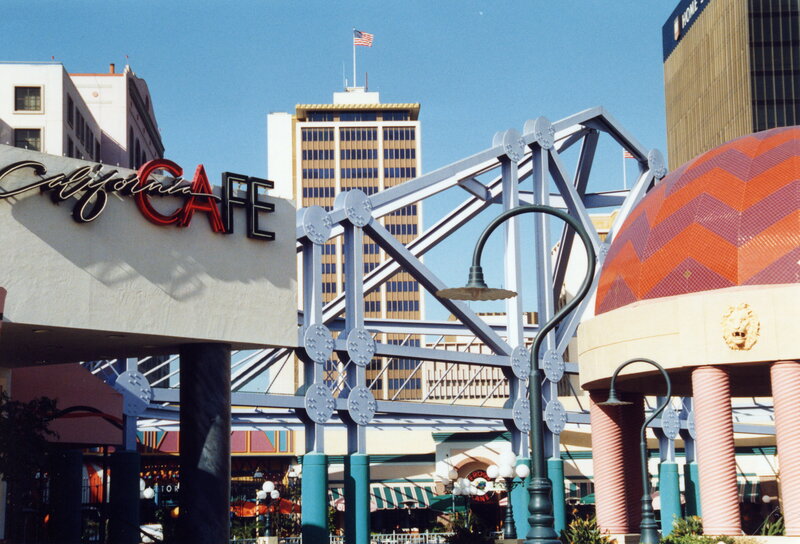 The colourful zany architecture of Horton Shopping Plaza in downtown San Diego is one of the few shopping malls I actually like. 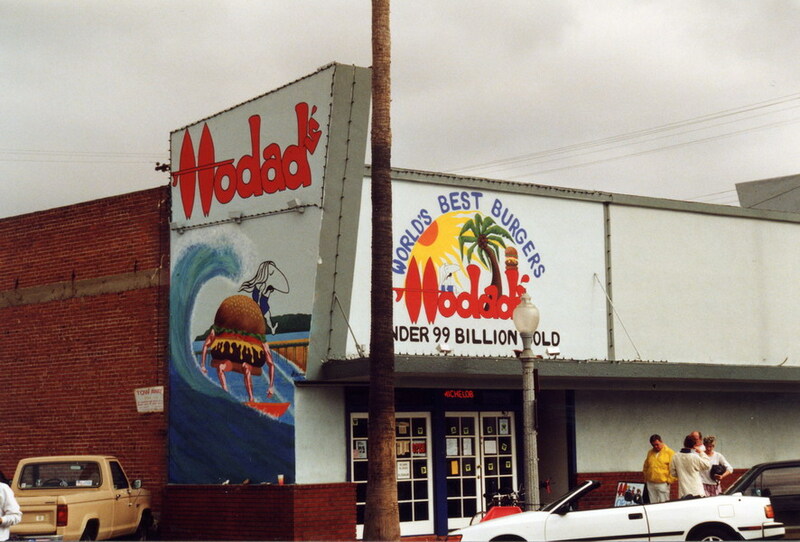 Modad’s of Ocean Beach, San Diego proudly advertising the fact that they have sold under 99 billion burgers.